We are delighted to offer a selection of gourmet platters and prepared dishes for parties and other large gatherings. Please allow a minimum of 48 hours advance notice to ensure your order can be completed appropriately and is as fresh as possible at the time it is to be picked up. Choose from three different platter sizes - small, medium or large - so that quantities can be tailored specifically to the size of your gathering. Shrimp Cocktail – fresh sweet, cooked shrimp served with house made cocktail sauce. Available in small and medium-size platter only. Sandwich Platter – a delicious selection of ham, turkey, roast beef and vegetarian sandwiches served on fresh-baked baguettes. Also available as wraps. Cheese Board – choose from a broad selection of local and imported artisan cheeses to create an edible centerpiece for your table. 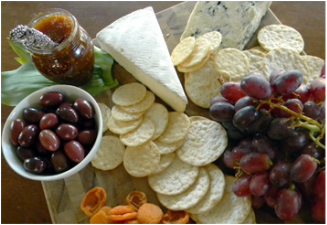 Features a minimum of three cheeses accompanied by either crackers or baguette, preserves and fresh, seasonal fruit. Charcuterie – Slow Food-approved cured sausages and other meats; pâtés, terrines and confits. Crudité – a variety of crunchy, seasonal fresh vegetables and accompanying house made dips. Mixed Greens Salad – flavorful, tender mixed greens, tossed with crisp garden vegetables. Best served with house made sherry vinaigrette. Crab Cakes with Remoulade – tender, flaky and delicate crab cakes mixed and presented with French sauce remoulade, an aioli-based condiment perfect for dipping. Choose from a delicious selection of classic preparations for your next party. All main courses are available in half or full-size hotel pans. Cassoulet – a dish that originated in the south of France, our cassoulet is a rich, slow-cooked casserole featuring pork shoulder, duck confit, garlic sausage and white beans. 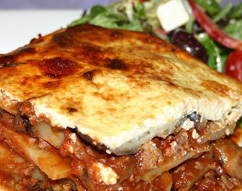 Moussaka – ground lamb, eggplant, tomato sauce, béchamel and chèvre combined in a luscious, traditional Greek dish. Braised Short Ribs – slowly braised beef short ribs meld with horseradish and either red wine or dark beer for a rich and meaty main course. Perfect served with our whipped potatoes. Coq au Vin Blanc – chicken legs and thighs are cooked to perfect tenderness with white wine, herbs and a mix of stocks. Seven-Hour Leg of Lamb – gently braised in either red or white wine, herbs and a touch of chicken stock to create an entrée that will fall apart at the slightest touch. Roasted Salmon Niçoise – a whole, roasted salmon presented chilled; served with haricot vert, sliced tomatoes, sliced eggs and olive tapenade. Lasagna Bolognese – fresh pasta sheets, layered with a traditional pork and veal bolognese sauce, red sauce and béchamel in a rich casserole. Macaroni and Cheese – a pasta classic prepared with a blend of Gruyère, cheddar and parmesan cheeses, melted into a rich béchamel sauce; slow baked until browned and bubbling. Quiche – choose from a rich, bacon and Gruyère-laced Lorraine or spinach-filled Florentine quiche made with local eggs and cream. Our selection of side dishes changes according to season and availability. Please inquire about current selections.